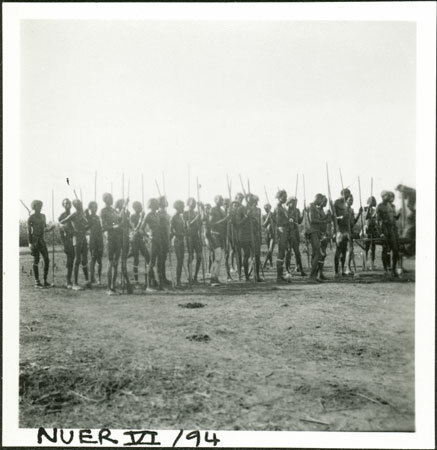 A line of male dancers with spears, one with ash decoration on his legs, looking towards the camera. The location is Yakwach camp on the Sobat River, which Evans-Pritchard revisited in 1935. Evans-Pritchard noted that in camps such as Yakwach dancing occurred nearly every evening. Note on print reverse ms pencil - "64 3 A146" & print front border ms ink - "NUER VI/94"
Morton, Chris. "A Nuer dance" Southern Sudan Project (in development). 03 Jan. 2006. Pitt Rivers Museum. <http://southernsudan.prm.ox.ac.uk/details/1998.355.294.2/>.